When I called Compassionate Cultivation CEO Morris Denton and said we wanted to ask him about marijuana law in Texas, the man behind the state’s first retail dispensary seemed confused. “I was hoping you were going to explain marijuana law in Texas to me,” he laughs. Yes, getting green legally in the Lone Star State is complicated, and it requires far more than chronic back pain. 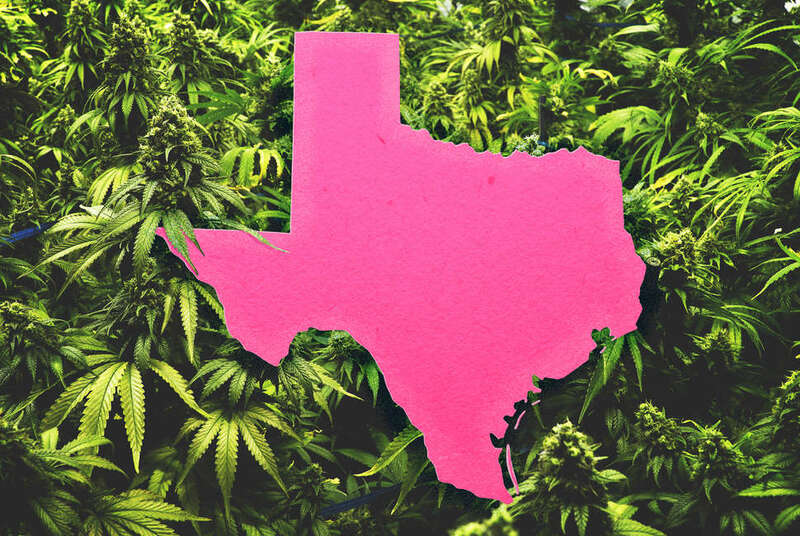 Texas is traditionally one of the most conservative states in America, and its historical approach to cannabis legislation is no exception. Passing the Compassionate Use Act in 2015 was a landmark moment, but it’s probably going to be a while before anyone can spark up legally in the home state of Willie Nelson. That doesn’t mean progress isn’t being made. Here’s the full story on what you need to know. Yes, but you’re not going to see green crosses on the side of the road like you might in Washington or Colorado. Medical marijuana is legal in Texas only by the thinnest of technical definitions. In 2015, the state passed the Compassionate Use Act, but it is regarded as one of the most restrictive pieces of medical marijuana legislation in the United States. How can I get a prescription under the Compassionate Use Act? You probably can’t. To qualify to receive medical marijuana in Texas, the Compassionate Use Act states that you must be a permanent resident of the state and suffer from “intractable epilepsy.” That’s the only way you can ingest even a minuscule amount of THC without breaking the law. To get prescribed, a certified physician must determine that the risk of low-THC cannabis is reasonable relative to the potential benefit. A second certified physician must then concur with the first physician’s assessment. Prospective patients must have also tried at least two other antiepileptic drugs without seeing results before they can be prescribed medical marijuana. What types of physicians can prescribe it? Only physicians certified in neurology or epileptology who belong to the Compassionate Use Registry of Texas are able to provide assessments as to whether a patient qualifies for medical marijuana use. State-wide, there are currently only 31 physicians on the registry, although the number has grown over the years. The Compassionate Use Act also states that medical marijuana must be “prescribed” by doctors rather than “recommended.” This is significant because federal law states it is illegal to prescribe Schedule I narcotics like marijuana. This has been said to cause some hesitation among doctors. Not all of them want to prescribe something federally prohibited, even if the state (through restrictive legislation) allows them to. Who can sell marijuana in Texas? When it was passed in 2015, the Compassionate Use Act required the Department of Public Safety to provide licenses to three dispensaries by September of 2017. This didn’t quite happen, but they didn’t miss the mark by much. Cansortium Texas, which was licensed last September 1, and Compassionate Cultivation, licensed on October 31, have brick-and-mortar locations. Surterra Texas, licensed on December 15, is currently growing its first crop of products, soon to be available for delivery statewide according to its website. In December, Cansortium Texas opened the state’s first dispensary in Schulenberg, Texas. The dispensary, Knox Medical, is not a dispensary in the traditional sense, as it does not have a storefront, but they do deliver. On February 1, they were responsible for a 6-year-old girl from central Texas becoming the first person in Texas to receive a legal delivery of medical marijuana. A week later, on February 8, Compassionate Cultivation opened the state’s first walk-in dispensary just south of Austin. “Right now we’re probably around 100 patients that are part of our business,” Denton says. “Not all of those patients are returning patients, because this medicine is not a cure. It helps some people but might not help others. What we expect to see is around a 70% return rate from all of our patients. The reality is that we're acquiring new customers daily." What exactly can they sell? Though the state has now doled out a few licenses to operate dispensaries, no one in Texas is actually legally getting high. The Compassionate Use Act only permits for the sale of “low-THC cannabis” that must contain 0.5% THC or less, and no less than 10% cannabidiol, or CBD. For comparison, federal law allows hemp products, which are legally available for purchase online, to contain 0.3% THC. Dispensaries may only sell medical cannabis in the form of cannabidiol oil, and under no circumstances is smoking marijuana permitted in the state of Texas. Only licensed dispensaries may grow it, and they may only do so with the intention of processing it into the specified low-THC oil. "Whether it's 0.5 or 0.7 or 1 or 2.5, you could argue that that is an arbitrary number because it affects people differently,” says Denton. “You have to have a standard somewhere. Where Texas has set that standard is where Texas has set that standard. There's plenty of research and science that suggests that a higher concentration of THC is more efficacious for people with a variety of conditions, but that doesn't necessarily mean that it needs to be 5% or whatever. I think the concern is that the state didn't want to have any amount of THC in it that could lead a person to have a psychological reaction." Is recreational marijuana legal in Texas? No, not under the Compassionate Use Act or any other law. What about new efforts for marijuana legalization in Texas? Possessing up to 4 ounces of marijuana is a misdemeanor punishable by up to 180 days in jail, but efforts to scale back punishment have gained support in recent years. In 2017, House Bill 81, which would have decriminalized possession of 1 ounce or less, made it into the Texas House voting schedule before the conservative Texas Freedom Caucus was able to prevent an actual vote from taking place. The bill received 41 co-sponsors on both sides of the aisle and was authored by Democrat Joe Moody. Though the bill stalled, there have been signs the state is relaxing its stance on marijuana use. On December 1, the city of Dallas began issuing citations rather than making arrests for possession of fewer than 4 ounces of marijuana. HB 2107 was written by Republican Jason Isaac and Democrat Eddie Lucio III. “We’re going to keep fighting as much as we can,” Lucio III said in a video announcing that HB 2107 would not make it onto the floor for a vote. Though the state failed to pass new marijuana legislation in 2017, support for more progressive marijuana policy is clearly building, and advocates are optimistic about what could be possible at the state’s next legislative session in 2019. "Texas is a very conservative state. It has a conservative governor. It has a conservative legislature. So [new legislation] isn’t inevitable,” says Denton. Still, he says he remains hopeful given how the Compassionate Use Act has provided epilepsy patients with access to medical marijuana. Ryan Bort is a contributing writer to Thrillist.